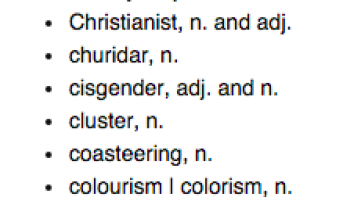 Cisgender: Oxford English Dictionary addition. A selection from the OED’s new word list. While Friday marked a historic victory for the LGBTQ community, it turns out there’s another advancement to celebrate: Last week, the Oxford English Dictionary released a list of 500 new entries, and among the more notable additions was cisgender. The word—which is defined as “designating a person whose sense of personal identity matches their gender at birth”—is seen as an opposite and complementary term to transgender. To be considered for the OED, a word must have been in use for several consecutive years. While cisgender has been around since the 1990s, The Cut points out that until recently it was largely used by academics in scholarly circles and was not widely known. But the word has been gaining recognition in more public spheres. Julia Serano, who wrote the 2007 transfeminist manifesto Whipping Girl: A Transsexual Woman on Sexism and the Scapegoating of Femininity, used the terms cissexual, cisgender, and cis privilege in her book. And more recently, cisgender become a label Facebook users could choose for their profile, when the site introduced 56 gender options, all the way from A (agender) to T (two-spirit) in 2014. Making cisgender a more widely known and used term could have major social implications. By encouraging all people to see themselves as having gender identities, it helps chip away at the idea of cisgender people as the norm and trans as other. The OED’s inclusion of cisgender won’t fix the significant issues facing transgender people in the United States and abroad. But words matter, and the recognition of cisgender adds necessary nuance to the social discussion. Want to hang out with Outward? If you’ll be in or near New York City on Monday, July 13, join June Thomas, J. Bryan Lowder, and Mark Joseph Stern—and special guests Ted Allen, ofQueer Eye and Chopped fame, andmarriage-equality campaigner extraordinaire Evan Wolfson—for a queer kiki at an Outward LIVE show, hosted by City Winery. Details and tickets can be found here.